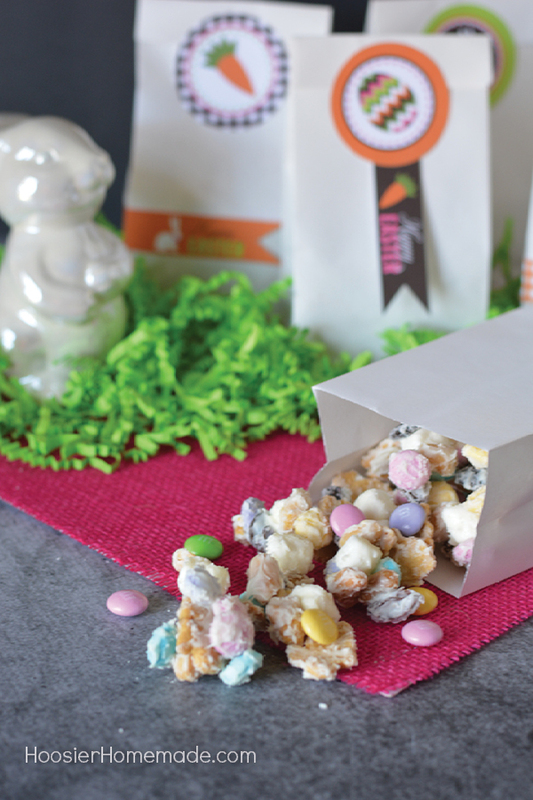 Here comes Peter Cotton Tail… hopping down the bunny trail. 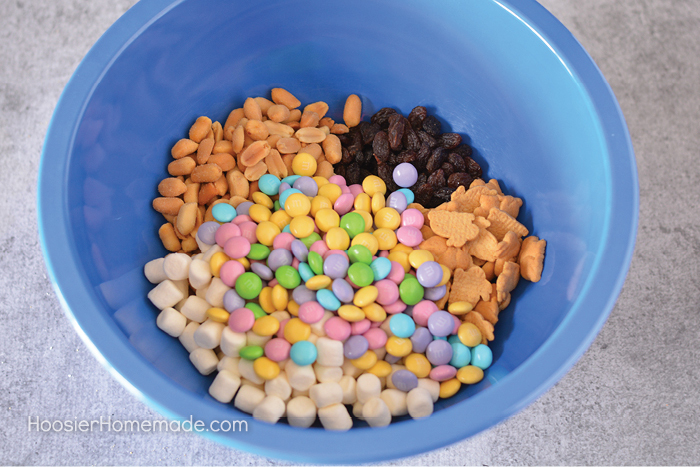 Make sure that the Easter bunny visits your house with this easy Spring Snack Mix with Free Printables! 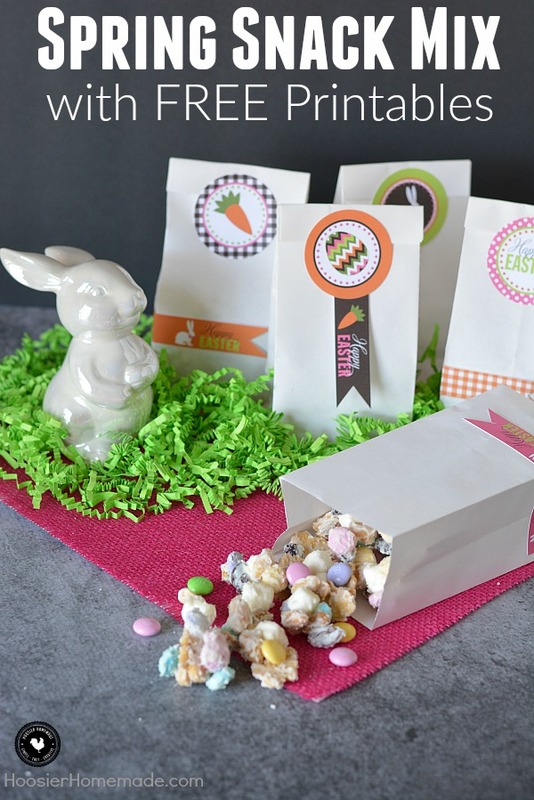 This simple and quick treat will be a favorite with the bunnies- and the people too! With the kids home for Spring break and extra family members around for the holidays, it is nice to have a quick (and cute) snack around. 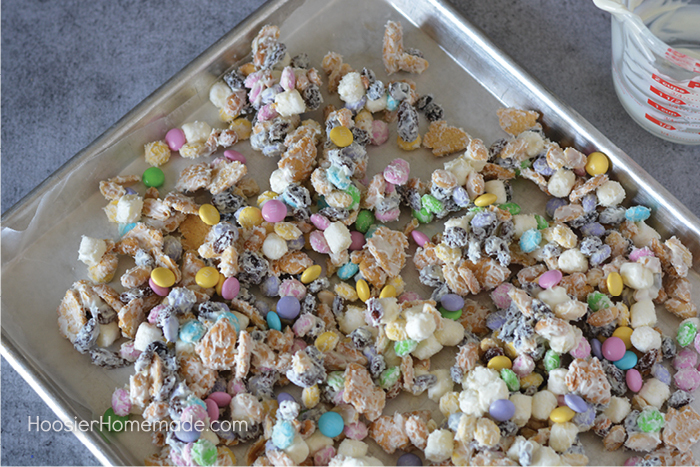 This Spring Snack Mix fits the bill- easy to make, transport and give away- it is the perfect Spring break snack! 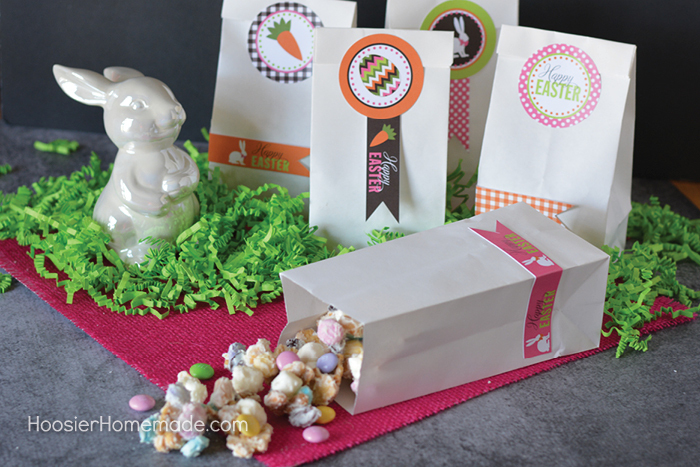 To make handing out snacks even easier, pour the spring snack mix into white paper bags and attach our free printables (I just used double sided tape!). The finished product is so cute it also makes an easy gift or centerpiece. To make your own Spring mix, first, gather all of the ingredients! Next, throw them into a bowl. This is a perfect job for little hands! Mix them up (and try not to sneak your favorites!). In a microwave safe container, melt the white chocolate and pour it over the mixture. Stir to coat well. Place wax paper on a cookie sheet and spread the mixture out evenly over the cookie sheet. Let the mixture sit until hardened and then break into pieces and put into the bags. So simple! 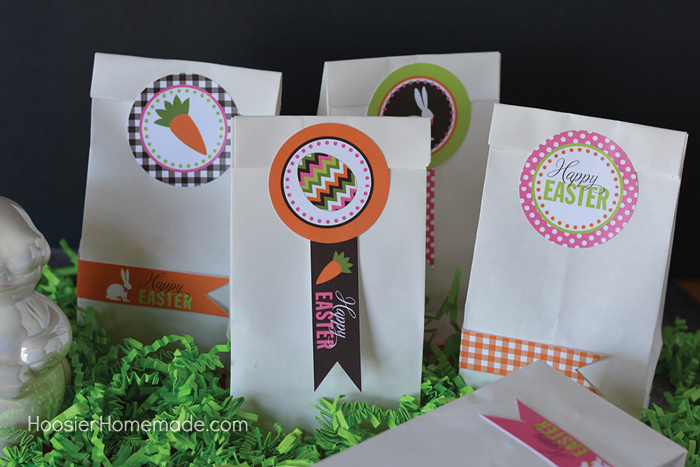 Add the printable onto the bag and you have a fun and portable treat! 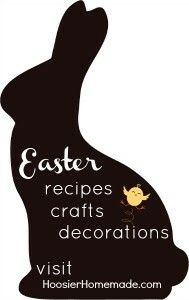 We all love the printable Cupcake Toppers, have you thought about other ways you can use them? 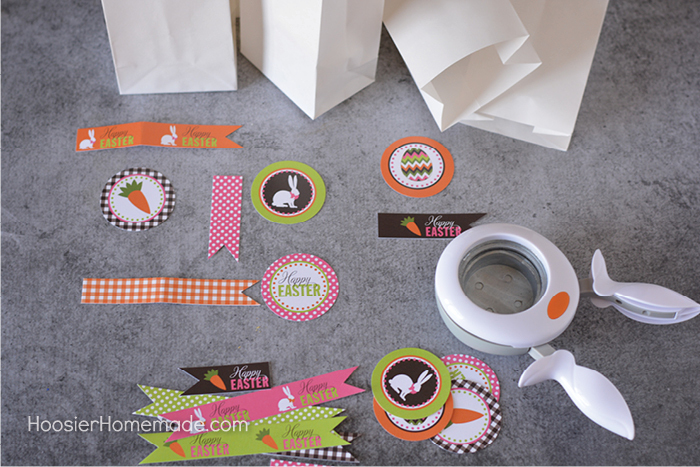 Simply cut them out with a 2 inch hole punch, cut the flags out and attach to the bags with double sided tape. 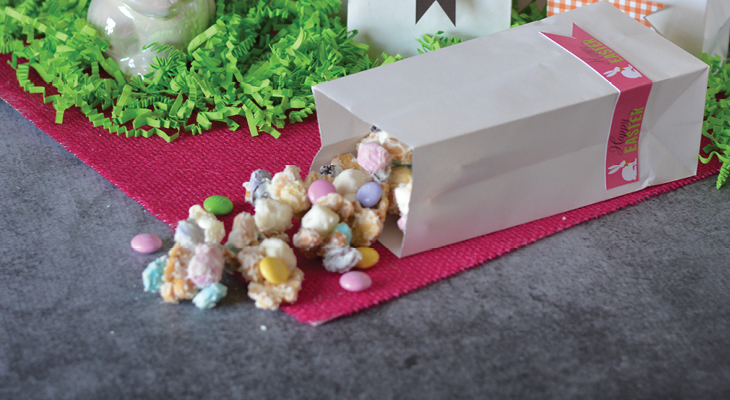 These Easter treats are the perfect bunny bait- and people seem to love them too! Place wax paper on a cookie sheet and set aside. 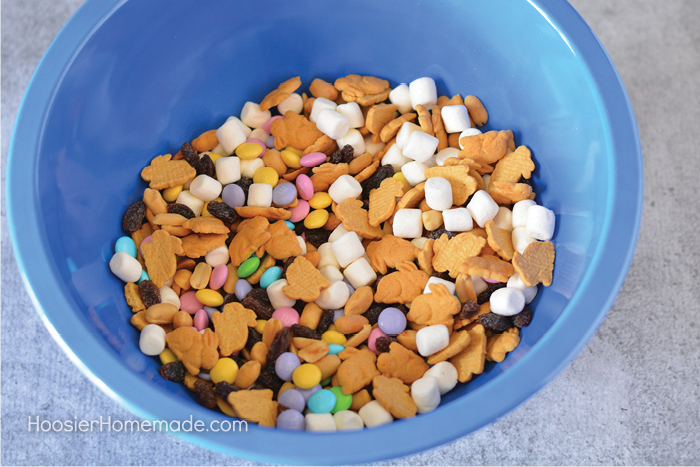 In a large mixing bowl, add peanuts, raisins, m&ms, graham crackers and mini marshmallows. Stir to mix well. 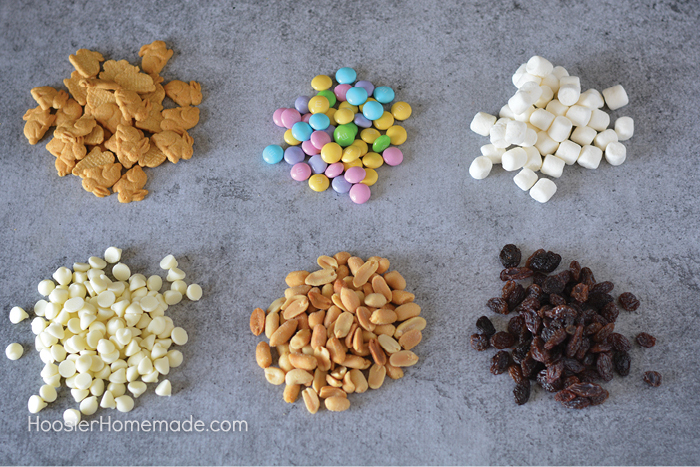 In a microwave safe container, heat the white chocolate chips on high for 45-60 seconds. Stir until completely melted. You may need to microwave in 15 second increments to get it to melt completely. 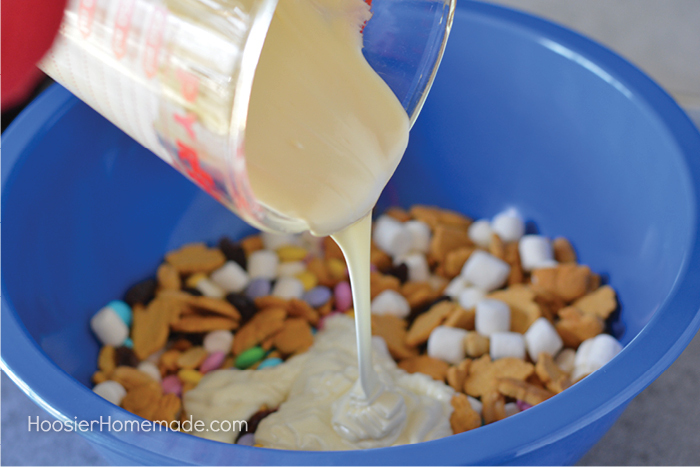 Pour melted white chocolate into bowl and stir well to evenly coat the mix. Spread onto prepared pan and let set about 15 minutes or until hard. Break into pieces and bag.